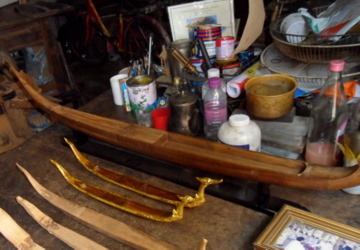 The model royal barge builder specialises in making Suphannahongse royal barges, the Thai royal barge, with painstaking skill and fine detail producing works of art that are fit for kings. Finding the place wasn’t easy. So it was with deep satisfaction after more than an hour’s search along Sukhothai Road, that I finally found it. Acharn (teacher) Paisal (pai-san) warmly welcomed me to his workshop and invited me to a seat. After I explained the purpose of my visit, he started telling me about his work and his community. 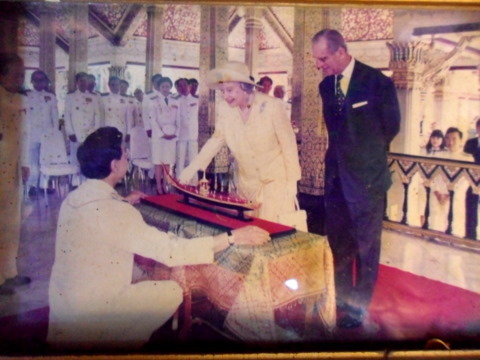 Acharn Paisal started life as a teacher in Physical Education at the age of 25, a job he held for ten years before leaving to take up model royal barge building. 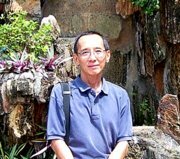 He is 73 today and still active. "The process of learning from a teacher, who doesn’t impart knowledge directly to the pupil, but the pupil watches, learns and practices on his own. Over time, the pupil builds up his skill." Just then, a young man smartly dressed in a shirt and tie rode up to the house on a motor-cycle, holding a bicycle tyre tube in one hand. Acharn Paisal explained that in between building model royal barges, he repairs motor cycle tyres and bicycle tyre tubes as well! Acharn Paisal lives not far away from his workshop and he elaborated on the history of the soi and the community where he lives. 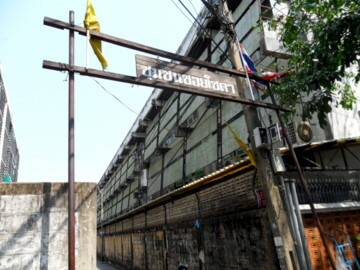 More than 100 years ago in the reign of King Rama V (1868 – 1910) there was a soda factory here, the first soda factory in Thailand. 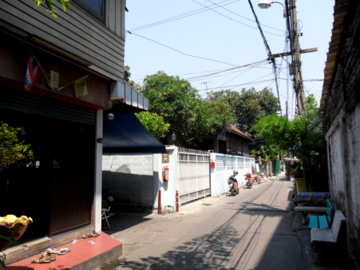 Consequently the soi was called Soi Soda and the people who lived there, the Soi Soda Community. 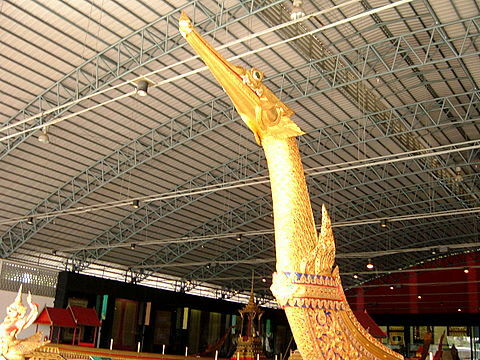 This name is still used today even though the official name of the soi is Soi Sukhothai 10. 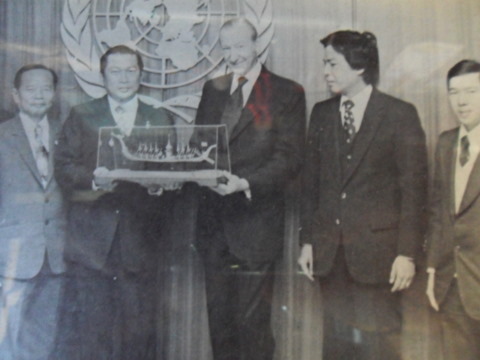 Suphannahongse royal barges made by Acharn Paisal have been presented to royalty and statesmen. These two old photographs and this old newspaper article hold the pride of place in Acharn Paisal’s workshop. 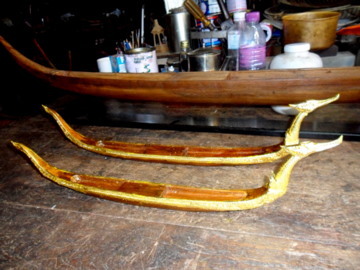 From the models in various stages of completion, we can have an idea of how a model royal barge is made. 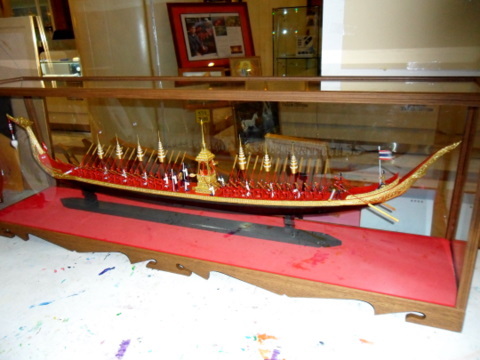 The outline of the model royal barge is carved out from a solid block of wood. 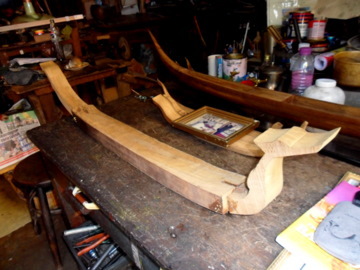 The seating compartment in the barge is then hollowed out. 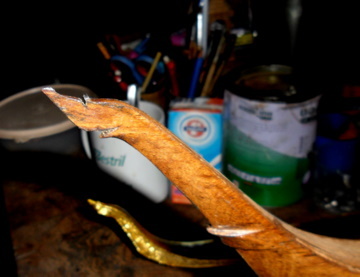 The hardest part is carving the swan’s head at the bow. It’s even harder at the stern. One wrong stroke and it will all be ruined. The basic model is then painted. Next stage is the intricate details in the barge as you will see later. 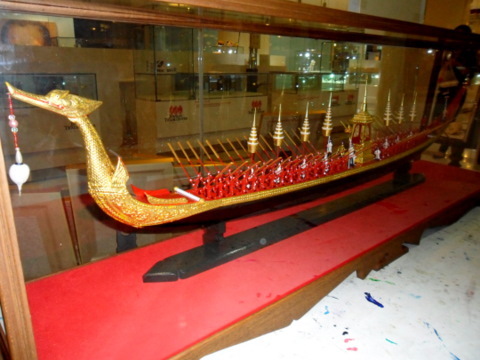 A model royal barge that’s just under a metre in length takes about 15 days to complete and costs about 85,000 baht. 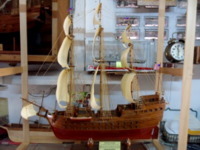 A 60 cm model costs about 6 -7,000 baht and a 30 cm model about 5,500 baht. As work only commences when there is an order, there weren’t any completed models to view. Unfortunately I went a day too late. 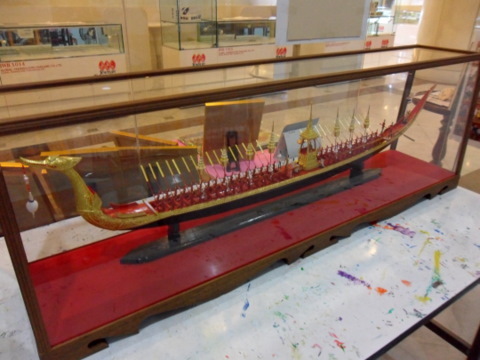 Just the day before a customer collected a completed model Suphannahongse royal barge as a farewell gift to an expatriate manager who was going home. Someone will be taking home an invaluable souvenir from Thailand. But all was not lost. Acharn Paisal called his friend, Acharn Kamol (ka-mon) an art teacher in oil painting. 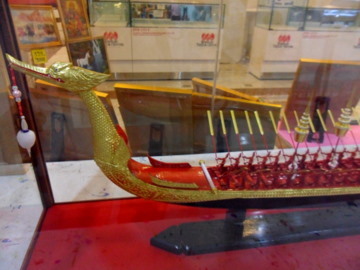 There was a completed model of the Suphannahongse Royal Barge at Acharn Kamol’s studio in Silom Galleria. 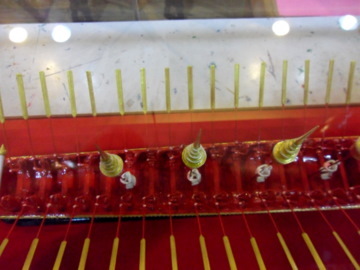 The completed model Suphannahongse royal barge will look like this. Note the painstaking work that has gone into details like the swan’s head, royal pavilion, benches, oars and the little figures representing the crew of the barge. All I had was the incomplete address, 159 Sukhothai Road. 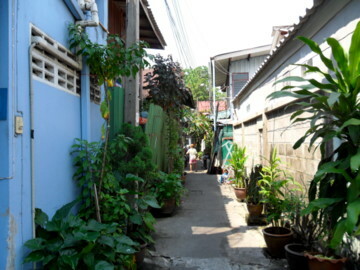 So I started from one end of Sukhothai Road and worked my way down from house number 497. I asked residents along way. Nobody seemed to know the place. Finally I was directed to the Dusit District office but drew a blank. However somebody suggested I try the Dusit District Post Office. The post office staff invited me into their mail sorting room where there was a huge wall map of the district. Every house was marked on this map except the one I was looking for. Then the postman who made the regular delivery runs was called in. 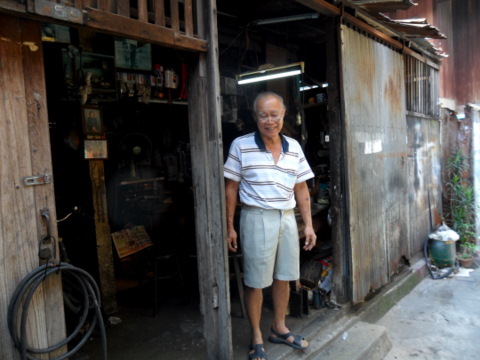 He pointed to the exact spot where house number 159 is located in Soi Soda! Even the staff at the post office use this local name rather than the official one. Take a taxi to Soi Sukhothai 10. Drop off at the junction. The soi is too narrow for the taxi. 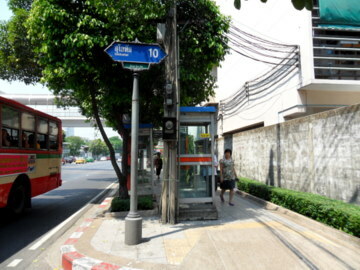 After you have walked into the soi, take the first turning on the left. Walk about 50 m down this soi. House number 159 is on the left. 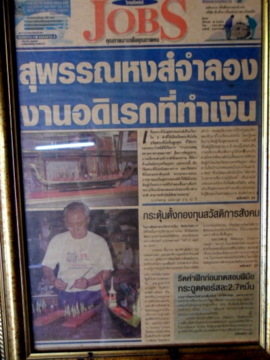 Acharn Paisal conducts model royal barge building classes as well. There is no time limit for these classes. Those interested can make enquiries directly. I would like to express my gratitude to Acharn Paisal Nettasut for his hospitality, his openness in telling me about himself and his work. 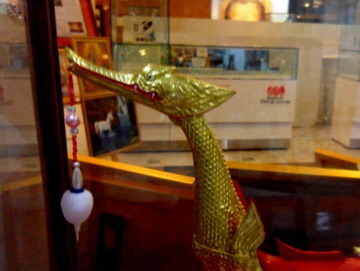 He went out of his way to make sure I got a view of the completed model Suphannahongse Royal Barge. 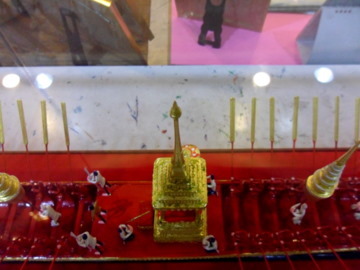 My thanks to Acharn Kamol for kindly permitting me photograph the model Suphannahongse royal barge in his art studio. Last but not least, the staff of the Dusit District Post Office for helping me find the model royal barge builder's house. They were really great! 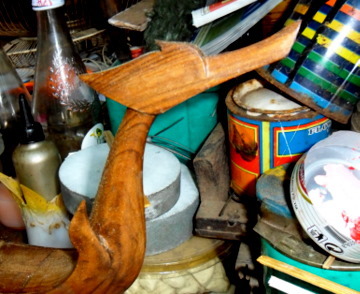 Acharn Paisal was initially hesitant in having a photo of his workshop which he felt wasn’t in very good condition. I assured him that our readers aren’t interested in glossy touristy places. 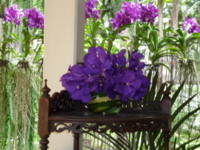 They want to learn about the lives of ordinary men and women going about their daily work with quiet dedication while contributing to their communities and to the craftsmanship of Thailand. Thank you Acharn Paisal for the learning experience.